Seats going fast for bus to Manzanar from Little Tokyo. The Manzanar Committee announced that attorney Dale Minami of Minami and Lew, L.L.P. 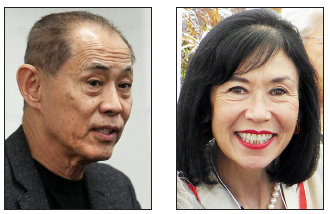 and Karen Korematsu, founder and executive director of the Fred T. Korematsu Institute, will be the featured speakers at the 50th annual Manzanar Pilgrimage, scheduled for 11:30 a.m. on Saturday, April 27, at the Manzanar National Historic Site. Each year, more than 1,000 people from all walks of life attend the Manzanar Pilgrimage, including students, teachers, community members, clergy and former incarcerees. Planning is under way for the daytime event, as well as for the annual Manzanar At Dusk program, which follows each pilgrimage that same evening. This year’s theme is “50th Manzanar Pilgrimage: An Enduring Legacy for Civil Rights.” The program will be emceed by former Assemblymember Warren Furutani, one of the founders of the Manzanar Pilgrimage and the Manzanar Committee, and writer/artist traci-kato kiriyama of the PULLProject. Minami is best known for being the lead attorney in Korematsu v. United States (1983), which vacated Fred T. Korematsu’s conviction for violating the forced removal orders in 1942, which was upheld by the U.S. Supreme Court in 1944. Other landmark decisions that Minami has been involved in include: United Pilipinos for Affirmative Action v. California Blue Shield, the first class-action employment lawsuit brought by Asian Pacific Americans on behalf of Asian Pacific Americans; Spokane JACL v. Washington State University, a class-action suit on behalf of Asian Pacific Americans to establish an Asian American Studies program at Washington State University; and Nakanishi v. UCLA, a claim for unfair denial of tenure that resulted in the granting of tenure after several hearings and widespread publicity over discrimination in academia. Minami is a founder of the Asian Law Caucus and was appointed as chair of the Civil Liberties Public Education Fund by President Bill Clinton in 1996. He is also involved in many other community and legal organizations, along with several governmental agencies. Korematsu founded the Korematsu Institute in 2009, the 25th anniversary of a federal court’s favorable ruling in her father’s case. Since then, she has worked as a civil rights advocate, public speaker, and public educator, sharing her passion for social justice and education at K-12 public and private schools, colleges and universities, law schools, teachers’ conferences and organizations across the country. The recipient of numerous awards and honors for her work, Korematsu is also a lead member of the national advisory boards of both the Fred T. Korematsu Center for Law and Equality at Seattle University School of Law and the Fred T. Korematsu Professor of Law and Social Justice at the William S. Richardson School of Law, University of Hawaii at Manoa. “Let’s remember that 2019 is the 75th anniversary of Korematsu v. United States,” added Embrey. “Let’s remember that not that long ago, our government, the government of the United States, prosecuted and convicted a young man by withholding, altering and falsifying key evidence and then incarcerated him for no other reason than his ancestry. For the daytime program, cultural performances will begin at 11:30 a.m., while the main portion of the program begins at 12 p.m.
Pilgrimage participants are advised to bring their own lunch, drinks, and snacks, as there are no facilities to purchase food at the Manzanar National Historic Site (restaurants and fast food outlets are located in Lone Pine and Independence, which are nearby). Water will be provided at the site, but participants are asked to bring a refillable water bottle that can be filled at refilling stations on site. Pilgrimage participants should also be aware that weather in the Owens Valley can be unpredictable and can change rapidly. The Manzanar Committee advises participants that they should always wear a hat, use sunscreen (ultraviolet light is not affected by clouds and is more intense at higher elevations) and to be prepared for any kind of weather, including high winds, heat, cold, and rain. The Manzanar At Dusk program will follow a couple of hours after the Manzanar Pilgrimage at 5 p.m. at Lone Pine High School, 538 S. Main St. (U.S. Highway 395), approximately eight miles south of the Manzanar National Historic Site, across the street from McDonald’s. The Manzanar Committee has also announced that seats are already going fast for bus transportation to the Pilgrimage from Little Tokyo. The bus will depart at 7 a.m., arriving at the pilgrimage at approximately 11:30 a.m., and will also take participants to the Visitor Center at the Manzanar National Historic Site following the afternoon program. The bus should arrive back in Los Angeles at approximately 8:30 p.m.
Reservations for the bus will be accepted on a first-come, first-served basis. The non-refundable fare is $45 per seat, $30 for youth (17 years of age and younger). Complimentary fares are available for those who were incarcerated at any of the former American concentration camps or other confinement sites during World War II. Both the Manzanar Pilgrimage and the Manzanar At Dusk programs are free and open to the public. For more information, or to reserve a seat on the bus, call (323) 662-5102 or email [email protected].